It is nine months since the devastating earthquake in Nepal, and there are still very few reconstruction projects underway. But in Bhorle, in the Langtang district, EcoSur consultant Ramon Gonzalez from Nicaragua has managed to start the rebuilding of a school. The EcoSur partners in Nicaragua have much experience in earthquake resistant construction, after all Nicaragua has one of the most complete and up-to-date set of building standards for earthquake resilience. 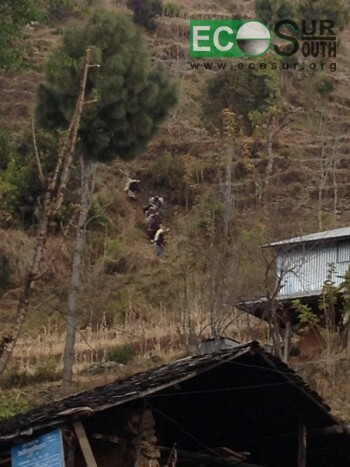 We reported in December that Gonzalez traveled to Nepal to build a school in the small mountain village. Bhorle has some 86 houses, built of rocks, mostly as dry walls. Nepal has „Guidelines for earthquake resistant building construction in low strength masonry“ and Gonzalez together with his local partner Rajezh started to draw the plans based on them. It was expected that there would be bureaucratic hurdles to be overcome, and nobody was surprised when already the first instance wanted some changes in the plans. Over the next seven weeks this happened over and over again, some of the changes demanded were clear, others were rather strange, windows had to be made smaller, but then larger again, smaller rooms, larger rooms... ever more concrete columns and beams. Urban technology or rural technology? Gonzalez wanted to build appropriate to the rural area, using rocks and mud and make concrete reinforcements according to the standards. However, the Government engineers wanted „urban technologies“, confined masonry with lots of concrete and if possible with dressed stones or bricks. After many discussions and debates, the plans were basically accepted, only one final signature was missing. But this was a new surprise... the last instance called for a building according to the mentioned standards. So, after 8 weeks of deliberation, it was practically the original design that was accepted. With the first day of the new year started the construction. 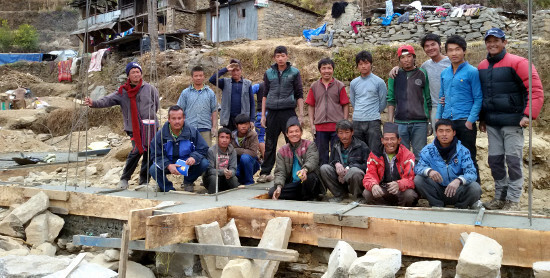 The Nepalese project director Ram Tamang organized cement, steel and other materials that are still scarce in Nepal and the community carried them to their village on their backs. Men and women alike took to the task, as even sand had to be carried. 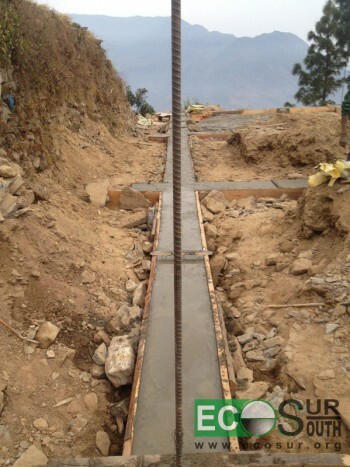 In just 18 days they managed to bring all the materials and build the foundations for the 5 classrooms and a teachers office and Ramon Gonzalez was able to handle the well started work over to Rajesh, who hopes to finish in April. This is a great success, because almost all reconstruction effort in Nepal is still halted due to materials shortage, bureaucratic hassles and heavy political problems between the government and the opposition which is backed up by neighbor India. But, being small and creative and working from the base up, made it possible.